While brakes are absolutely critical in stopping a vehicle effectively, other components, such as tires, shocks, and struts are routinely overlooked. This is due to the shock or struts inability to support the vehicle under braking causing the vehicle's front end to "nose-dive". This transfer of weight forward reduces the rear braking performance. 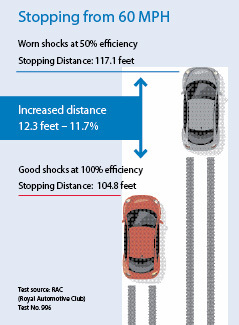 The results is poor traction and control which makes for longer stopping distances– a formula for an accident. New,high quality shocks or struts are designed to help your vehicle make quicker with safer stops under all driving conditions. ART can assist you in decreasing stopping distance and increasing ride control with KYB World Class Shocks & Struts. Performance Friction Carbon-Metallic, Porterfield Carbon-Kevlar, Posi-Quiet Semi-Metallic Extended Wear, or AXXIS Ceramic Brake Pads. O.E.M. Posi-Quiet Loaded or Unloaded Calipers (rebate available upon return of original caliper cores).